WaterWipes are a new type of diaper or baby wipe. It is meant to be natural and gentle on your baby's skin. These unique wipes can be used even on newborn babies. What makes them so special is that they are made of gentle ingredients that will help nurture and protect your baby's skin, not break it down with harsh chemicals. In fact, the wipes are wetted with 99.9% purified water. That remaining 0.1% is actually fruit extract. Grapefruit seed extract to be exact. This works as a natural moisturizer as well as an antimicrobial agent. So why would you want to use WaterWipes? The first thing is to avoid many ingredients found in common commercial diaper wipes. They can contain chlorine, alcohol, and other ingredients that can irritate your baby's skin. Let's face it, a newborn goes through at least eight to twelve diapers a day, that's a lot of diapers. And with every diaper change, you need, typically, at least two wipes, sometimes more. That is a lot of rubbing on the delicate baby skin of your newborn. While you can use these from birth without any problems, some parents don't look for alternatives to chemicals until after their baby has suffered from diaper rash. Because of the lack of chemicals in these wipes, there is a decreased risk of diaper rash, making them more attractive to parents who have a child who has suffered from nasty rashes before. 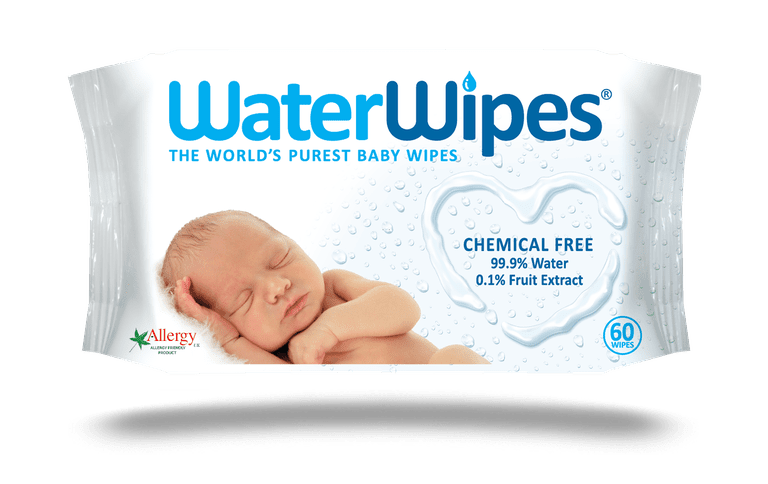 WaterWipes look and feel like other diaper wipes. They come in a convenient plastic package with a resealable top. This helps keep the wipes saturated and ready for use. Though some users have noted that the wipes can feel a bit dry. The company suggests that you simply seal the package and massage it, noting that because of the lack of chemicals, the water sometimes settles towards the bottom of the package. I noted this in my use of the WaterWipes, but it was an easy and simple fix that added perhaps five seconds every week to my routine. One of the things that I really liked about the WaterWipes is not their use in the diaper area, but the ability to use them for other things. I am certainly guilty of using regular baby wipes to wash sticky hands or remove dirt from faces. The problem is that would often leave the baby feeling slightly sticky from the chemicals in the wipes. With Water Wipes, I could use it on the baby's face and hands without feeling guilty. It actually hadn't even occurred to me until my husband stopped me from rubbing a regular baby wipe on the seat of the car to remove a spill. He was worried it would remove the color. That was an eye-opening moment. The WaterWipes are also good for older kids as well. My older children used them when finishing a sports activity to clean up. They would wipe down before getting in the car to remove some of the sweat. It certainly made for a less smelly car ride home, and they liked the fresh feeling. In the past, they've requested that I buy specialty wipes for this purpose. It's much easier, less expensive, and storage friendly to be able to have one multi-use item in the car. WaterWipes are not flushable, so do be careful in that regard. The material forming the wipe is 20% Viscose and 80% Polyester. Thus it is only 20% biodegradable. I would encourage you to try a pack of WaterWipes. They are strong enough to handle big messes without the chemical residue. They are commensurate in price with other wipes in the sensitive market. And they have multiple uses for many ages.